Thanks to all the great bloggers who have (and have yet) to participate in my blog tour! I've got a couple more interviews coming up this week, but I thought today, we'd take a break from me and let someone else talk for a while. My friend Alex Bledsoe, author of the Eddie LaCrosse series and those devilish vampires in Blood Groove and The Girls with Games of Blood, is taking the helm today to talk about urban fantasy and his newest novel, The Hum and the Shiver. 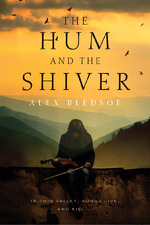 I've had a chance to read an ARC of The Hum and the Shiver, and Alex once more shows off his versatile talent by dishing up a new tale that moves like a song on a summer night. And there is a contest, so be sure you read for your chance to win a copy of The Hum and the Shiver. For those of you who don't know, Alex grew up in west Tennessee an hour north of Graceland and twenty minutes from Nutbush. He has been a reporter, editor, photographer and door-to-door vacuum cleaner salesman. He now lives in a Wisconsin town famous for trolls and mustard, writes before six in the morning and tries to teach his two sons to act like they've been to town before. You can keep up with Alex on Twitter, Facebook, and MySpace, and read his blog here. But what do you call it if the unicorn has to bring his tacklebox and catch his own cod? Or climb on the tractor and put the weevil spray on his cotton field? What do you call the tropes of urban fantasy if they're no longer urban, but are still contemporary? This is what I've run into trying to describe my next novel, The Hum and the Shiver, out in September from Tor. It's set in the modern, contemporary, up-to-the-minute world. There are cars, trucks, cell phones and computers. But the characters are farmers, returning soldiers, and small-town ministers. They may brush up against faery magic, but they do it in the mountains of East Tennessee, not the gritty streets of Chicago or St. Louis. The obvious inversion, "rural fantasy," seems kind of...blah. "Urban" implies trendy fashion, electronics, fast-paced transportation and the smell of exhaust pipes, which then makes a vivid contrast to "fantasy." "Urban" implies sophistication. "Rural," though, conjures up images of fields, forests and lakes, which are very much the traditional fantasy setting. And you have the same problem with terms such as "agrarian fantasy," "rustic fantasy," or "country fantasy." None of them imply modernity. There are other synonyms: "pastoral" might work, except that my story has trucks running from highway patrolmen, knives drawn in anger and at least one mention of dangling intestines. "Arcadian" has a nice lilt, but most people wouldn't know what it means; same with "bucolic," which sounds like an advanced form of colic, and believe me, that's nothing anyone wants to experience. Maybe my process is wrong, though. Is looking for antonyms to "urban" and/or synonyms for "rural" too obvious? Perhaps we need a totally unrelated term that connotes modern, yet rural, reality. Something that says farms, trailers, pickups and railroad crossings. I like "dirt road." "Dirt" implies the rural location, but "road" carries connotations of modern vehicles. Which gives us the term, "dirt road fantasy." What do you think? Is "dirt road fantasy" a valid opposite for "urban fantasy"? Will it ever catch on? Or do you have an even better idea? The best suggestion will win a free signed copy of The Hum and the Shiver. The contest will end July 24, 2011. ...and anywhere else worth hanging out. I had to approach a scene from a different character's point of view. It doesn't sound like a lot, but the gender change enabled me to add new plot twists that deepened the stakes for the characters. I'm always looking for that emotional build-up for my characters, and until this week, all the action was there, but very little emotion. Without the emotional angle, my reader isn't invested in the characters or their problems. The point of view change gave me the ability to show the reader information that my protagonist wouldn't know. I don't like frustrating my readers, and in this case, changing point of view moved the story along a lot faster. It's okay for my protagonist to be in the dark; however, the reader needs to know what is going on at all times. 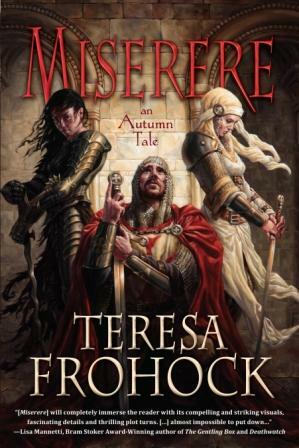 People seem to be enjoying Miserere, so I'm moving ahead with my synopsis of Dolorosa and will revisit Woerld as time allows.